Jamie was especially inspired by the color of the marble paper – it reminded her of the domes she saw in Prague, which led her to choose one of her all-time favorite photos to scrapbook. Because the photo is so special to her, Jamie made it the focal point and kept embellishments to just one quadrant of her page. I love how the marble peeks out from her title. 1. Create a layout featuring the trend of marble. The Only You kit is perfect for the challenge, but any materials will do. Traditional and hybrid layouts only, please. 2. Post your layout to your blog, a gallery, or our Facebook page. 3. Comment below with a direct link to your post. 4. Enter by Wednesday, February 17th, 9:00 pm Pacific time. The randomly selected winner will be posted on Thursday, February 18th. 5. If you are a subscriber and/or in the United States, you could win an autographed Dear Lizzy tote filled with a sampling of the new Happy Place collection! 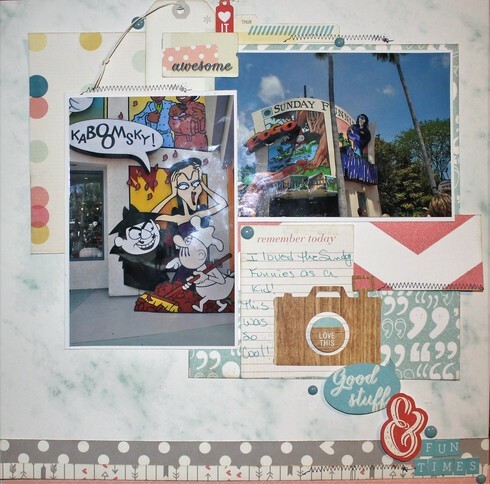 International friends are welcome to play along for a $20.00 credit to the Scrapbook Circle store. This is a great challenge and I LOVE your layout! !